We knew Jinhae is a faerie city of Cherry Blossom, and Busan is a hidden gem! But how about Seoul? Must we go to Jinhae which 312 KMs away from Seoul if we have limited time, 'only' to chase Cherry Blossoms? Well, Good news,Seoul is also home of Cherry Blossom especially pure white Cherry Blossoms! 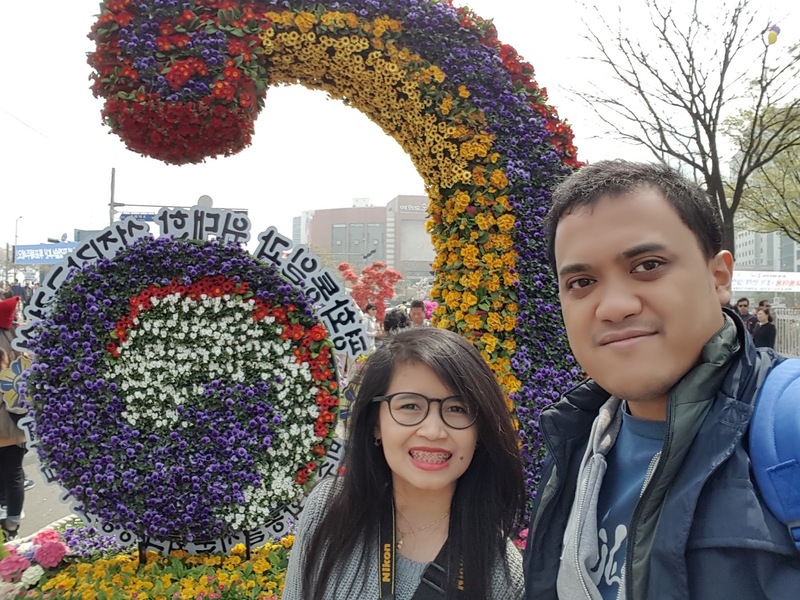 Although we can't see cherry blossom like everywhere (on the city streets or in front of restaurant-like we did in Jinhae), but there are two main tourist attractions to see Cherry Blossoms in Seoul; Namsan Park and Yeouido Park! Namsan Park is not only popular during Spring, but also in Autumn. Located on the hillside of Mount Namsan, Namsan Park is one of the famous recreational area also hiking path both for tourists and local residents. Started from Namsangol Hanok Village, we follow the path to hike to Namsan Park. At first, We have no idea that there will be Cherry Blossom Alleys waiting for us to the top. Namsangol Hanok Village is adjacent to one big park, and when we exited from it, we found another beautiful street to be followed. When we see the sign read of Namsan Park, we go to the stairs, then tunnel, big library, and get on the stairs again to find Namsan Park. The distance between the Village and Namsan Park is approx. 600 meters meanwhile the Namsan Park itself is 1.2 kms long of an empty street with trees and flower on the both side. When you see the number, don't get discouraged! One point two kilometers isn't feel long when we were surrounded by breeze and beautiful lining of cherry blossom. We just walk and taking picture of beauty white Chery Blossom along the way, without realizing it's actually far enough until we reach at the end of street. Since we came on the expected peak bloom date, this park were crowded especially by couple and families. We got lucky because arrived when the cherry blossom is on the peak. Some flowers looks very thick and like covered in snow, meanwhile the others looks already shed. Different from Jinhae or Busan, the bloom date in Namsan Park isn't in unison due to the varieties of cherry blossom. Once, I noticed the King Cherry Blossom varieties which usually bloom earlier than other varieties. Little trivia, did you know that after the petals are already shed, the cherry blossom will grow their leaves? Also, the fact that name Cherry Blossom, they don't bear cherry fruits that human usually eat. Continue our walk from Namsan Park, we notice that we can see famous N Seoul Tower from the street, and when we walk more, we (once again) accidentally found a shortcut to Myeongdong. Some people called that street as Cherry Blossom trail. Myeongdong itself is very popular market in Seoul moreover around the world. In there, we can shop almost anything, clothes, cosmetics, street snack, sport wears, accessories, and lots more in bargain price. It is not kinda 1-2 hours street market! We can stay there from noon until night and never tired of the street food. May be I will review the markets in Seoul any other time. The origins of cherry blossoms in South Korea is contentious. It is believed that the Japanese planted Yoshino cherry trees at Seoul's Changgyeonggung Palace and the viewing of cherry blossoms was introduced to Korea during Japanese rule. The festivals continued even after the Japanese surrendered at the end of WWII but have been controversial, and many cherry trees were cut down to celebrate the fiftieth anniversary of the Japanese surrender because they were seen as symbols of the occupation. Yet Koreans continued to plant Yoshino cherry trees and festivals began attracting a wide range of tourists. Many Korean researchers assert that the Yoshino cherry is the same species as a Korean indigenous species called "king cherry", whose mass production is still being studied. Despite the variety similarity, the cherry blossoms festival itself bit differ from Japan. In Japan, we know about Hanami, while people gather under cherry blossom trees to do picnic, like eating or just resting. In South Korea, I didn't see people picnic under the trees. They just walking or taking picture. Yeouido park located on Yeoui island- a large island in the Han River in Seoul, South Korea. It is Seoul's main finance and investment banking district. Yeouido is home to the National Assembly, Korean Stock Exchange, many large corporate headquarters, and Korea's three broadcasting stations: KBS, MBC, and SBS. Isolated for centuries, Yeouido is now tightly-connected to the Seoul transportation grid. Seoul Subway Line 5 and Line 9 intersect at Yeouido Station. We got there by ride Line 9, and notice that subway is first private subway line we see in Korea. But we don't get worried because even run by private, it is still use T-money to pay. We can't feel any difference service instead of the colors of line and station. We only went to Yunjung-ro, the road behind the National Assembly, which is famous for cherry-blossom viewing parties in mid April. We just walk there and didn't get a chance to explore the park or the famous Han River because our feet are already sore. But no matter what, The Yeouido Park is beautiful and worth it, the cherry blossoms bloom at the same time, and it is beautiful white!